Whenever you create or edit an Operate Licence, you have the possibility to select an Opportunity Type, represented by that particular Licence. You can customize this list by adding a new Standard field to your Licences. Press CTRL+F and search for "Opportunity Type". Click Opportunity Type - The Standard Field customization page opens and you have the possibility to view its existing options and add new ones. To add a new Opportunity type, scroll to the list of options and click New. Enter your field option, using the exact text you want to see displayed in the Licence dropdown list. For example, we will create an option for an Additional Licence, for situations when a customer already has an existing Licence and requires another one for new products or services. Save your chahges when you are ready. 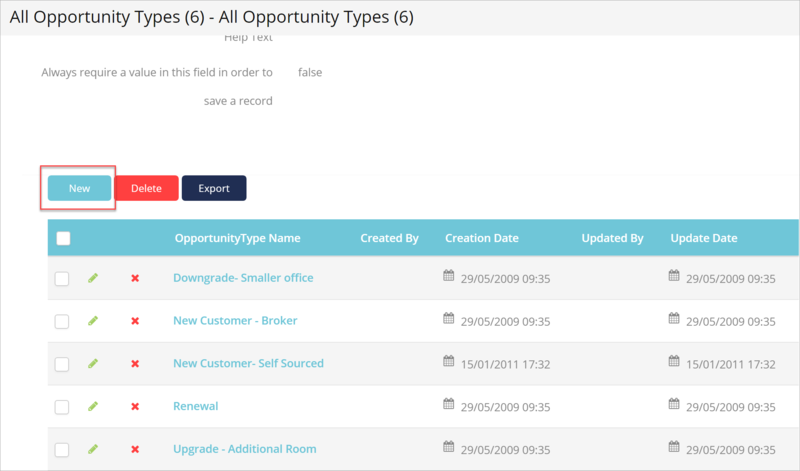 The Opportunity Type will now be added to your list of options and become available to select on your Licences.